This is a short history of Billion Dollar Agent and Best Agent Business from the founder Steve Kantor. Let me give you a short history leading up to Billion Dollar Agent. I grew up in San Diego, went to Harvard for college and graduated in three years. I came to Washington, DC, bought an Apple II plus computer and learned how to program. In my first job out of college, I did economic consulting for Clients such as the CIA, World Bank, IMF and the State Department. I only had one job out of college before starting my own business. I got a Masters from Johns Hopkins School of Advanced International Studies (SAIS) in Global Theory and History. After graduation, I backpacked around the world for a year and visited over 50 countries. When I returned, I started a software company named Gnossos Software. Gnossos Software was a database CRM software product company. I like databases. I grew Gnossos Software to a few million in revenue and sold the company in 2004. I took a year off in 2005 and came up with 100 business ideas. In 2006, I started a few of them under the name Lifebushido. Lifebushido is focused on building a global network of people, working part-time from home, with flexible hours, using their unique talents. We have business, creative and social entrepreneurial ventures. We are global and 100 percent virtual. We have more than 100 staff members who all work part-time and refer to themselves as Ishidos. Our fantastic team provides part-time, virtual assistant and calling services to small business entrepreneurs with $100,000 to $10M in revenue per year. We have conducted interviews with over 1,000 agents, completed over $1,000,000 worth of customer-driven research, built our Billion Dollar Agent Team to over 100 part-time assistants and callers from over 5,000 job applicants and worked with over 100 top agents as clients of Billion Dollar Agent. We have over 1,000 pages of solid systems that we use to run Database Management, Lead Management, Marketing, Listing Management, Closing Management, Accounting, Calling, Agent Management, Agent Recruiting and Life Management teams. As Billion Dollar Agent has grown, I have had over 1,000 30-minute phone call sessions with top agents doing over $100,000 in GCI. Detailed notes have been made during every single call. These notes have been fed back into our knowledge base and systems. We map out the patterns we see across different segments of the industry. Billion Dollar Agent is like Switzerland. 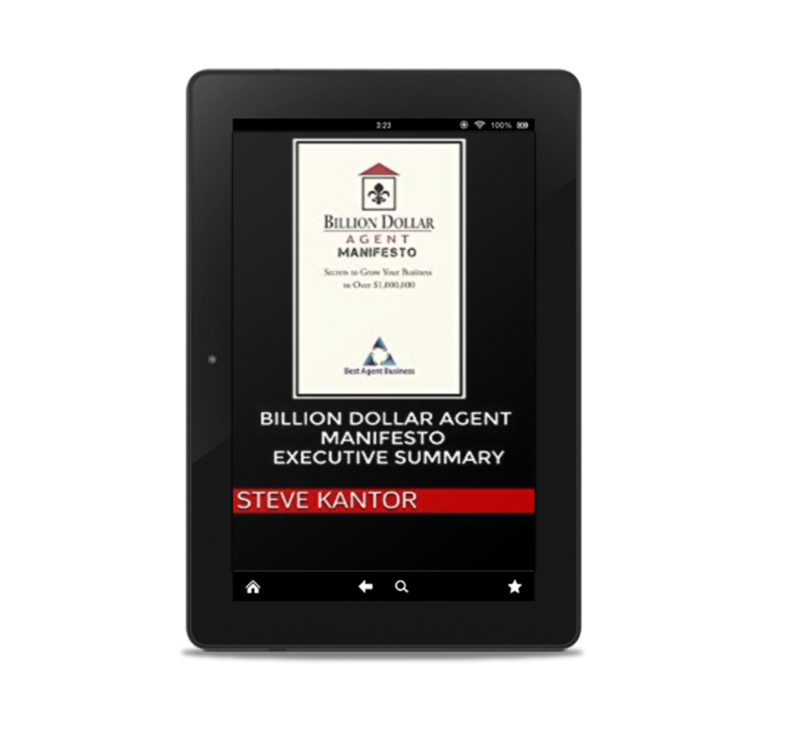 Billion Dollar Agent Manifesto offers insight into the best practices for entrepreneurs at any level of experience by featuring watershed moments from today’s most successful real estate agents. Get professional and personal insights from the trailblazers of the industry. 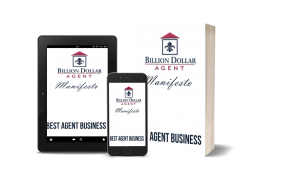 This special edition Billion Dollar Agent Manifesto Executive Summary is courtesy of Billion Dollar Agent. Schedule a free coaching call with Steve Kantor, President of Billion Dollar Agent, to receive your complimentary coaching and executive book. Billion Dollar Agent – Lessons Learned is based on interviews with real estate agents who have achieved $1 billion in career sales of residential real estate or are on track to achieve that level of success. The book includes the success secrets of top real estate agents. Over 50 interviews are included with agents who sold over $1 billion in real estate or will achieve $1 billion in career sales. Billion Dollar Agent includes interviews with top national coaches/trainers such as Howard Brinton, Mike Ferry, Ken Goodfellow, Walter Sanford, and Floyd Wickman. 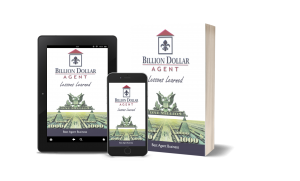 Billion Dollar Agent – Lessons Learned is written by Best Agent Business to help top real estate agents learn how to become a Billion Dollar Agent.